Finnerty's Blog: John Boehner: Who is going to jail over this scandal? Which of the plethora of scandals? 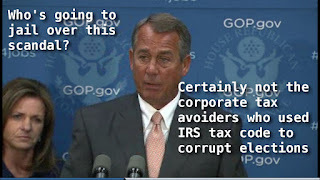 John Boehner: Who is going to jail over this scandal? Which of the plethora of scandals? 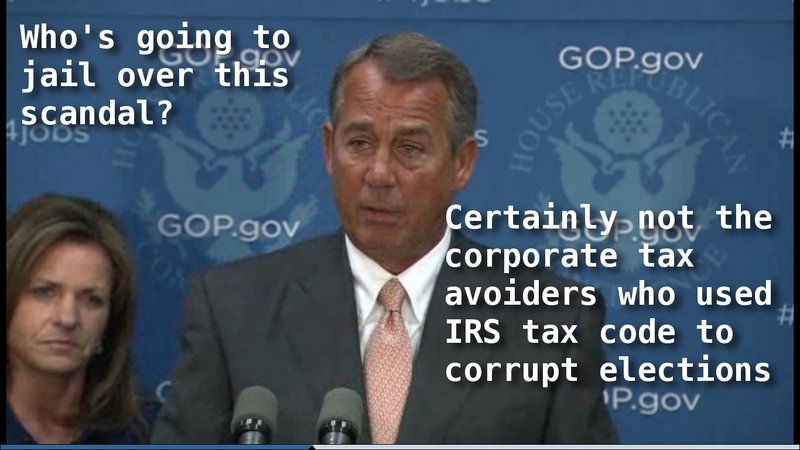 John Boehner stated in a press conference today: "Who is going to jail over this scandal?" Which scandal? LIBOR? House GOP gutting diplomatic security a year before the Benghazi attacks? Banks auto-signing foreclosing on homes that were already paid off? HSBC money laundering for drug cartels and Al-Qaeda affiliates? Director of the SEC Mary Jo White being paid by financial industry defense law firm $500,000 a year bribe (ahem... I mean retirement plan)? Supreme Court Justice Clarence Thomas obvious conflict of interest for his wife being paid by plaintiffs that appear in front of the U.S. Supreme Court, such as Citizens United Vs. FEC that created a new legal channel to affect elections and public policy with excessive and obtuse dark money? No, none of that, Speaker of the U.S. House of Representatives was instead referring to Internal Revenue Service bringing extra scrutiny to non-profit 501c4 organizations whose legal intended purpose was to "promote the general welfare" but public statements were to oppose taxes in all there forms. The scrutiny started back in 2010, after the U.S. Supreme Court decided Citizens United, and the anti-government movement flooded the IRS with requests most with newly named organizations with "Tea Party" and "Patriot" in them. As I wrote yesterday that the of the non-profit organizations that the IRS provided extra scrutiny to, 25% had conservative leanings with telling anti-tax terms in their names. All of whom were non-profit organizations that were the children of the Super PACs and the Citizen United decision, whose sole purpose was to make their finances opaque as possible and hiding the contributors before they went off to run deceptive political ads for the upcoming 2010 midterm elections. The actions of the IRS were far from adroit but it was equally distance from being illegal; it was equally legal to the Bush administration auditing Planned Parenthood, NAACP, Greenpeace, National Organization of Women and other left from center non-profits that existed before the Bush administration, and continue long after the shot callers of their political harassment have left office (unlike a majority of the non-profit organizations that were targeted). Mark Levin's Landmark Legal Foundation sparking this controversy, after 8 years of promoting the politicization of the IRS under the Bush administration, brought this to national attention after a 13 month effort. So has it become common wisdom that audits and extra scrutiny are only a tools to be used against the left without repercussions? Could there be any possibility that the same standards of behavior be for both sides of the aisle not leniency for those calling for uncompassionate market forces to mete out "justice" and rigid higher standards for proponents of universal forgiveness? Please comment what you think about the situation, and of course share and forward this to your social network.